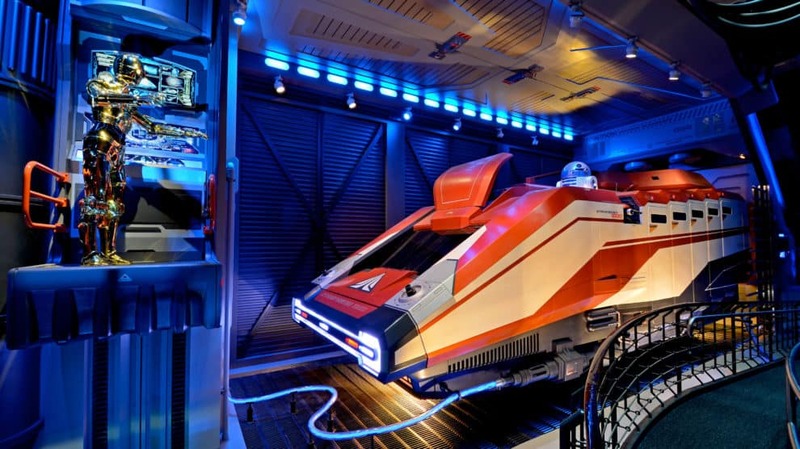 Star Tours is still one of the most fun simulator rides across the Disney parks. In this edition of Music Behind the Ride, I wanted to explore the musical history of the ride and its updates through the years. In a first for Disney, it was an attraction based on a non-Disney property. Hoping to bring a new audience to the parks, Michael Eisner partnered with George Lucas in what would be become Star Tours and Captain EO (the 3D Michael Jackson film that opened in 1986). 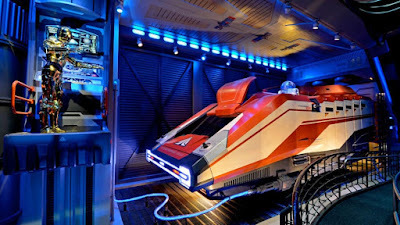 Star Tours would first replace the classic (and dated) Adventure Thru Inner Space at Disneyland. The ride is structured around a new ride system (the ATLAS) which allowed the Imagineers to sync the ride simulator with the audio and visuals of the film. Once inside the show building, the queue was designed as a terminal for your intergalactic flight with the schedule board showed departures for various Star Wars locations. 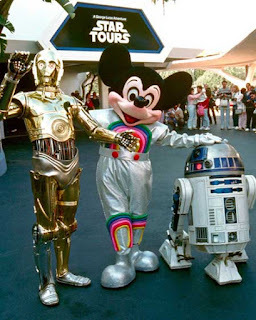 You see a large scale StarSpeeder 3000 alongside animatronic C-3PO and R2-D2. Various worker droids are in the next area (with some references to Adventure Thru Inner Space and recycled animatronics from America Sings). The announcement chimes and the planet advertisement music were all newly composed by Richard Bellis. After the short and funny safety video your group is ready for the trip to Endor. You meet the nervous animatronic pilot REX (voiced by Paul Reubens). After a few flight complications, your ship jumps to hyperspace and passes Endor to be caught in a comet field. A tractor beam drags your ship as you're now caught in the grip of the Empire. You make your way to the Death Star trench run, which you assist in ultimately destroying. REX pilots the StarSpeeder back home with almost a near collision in the hangar bay. 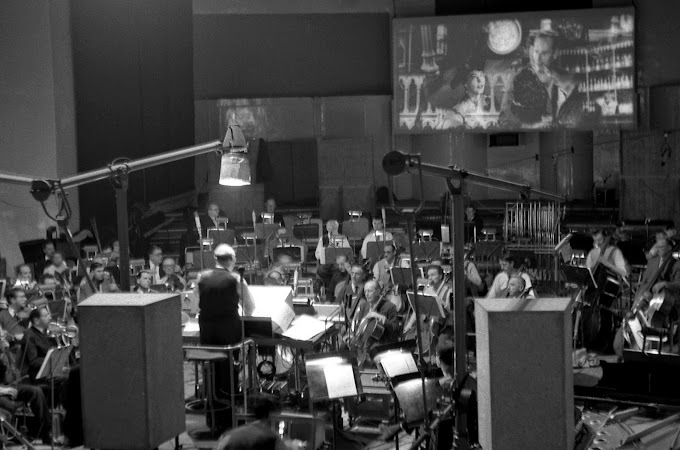 For the ride music, John Williams was brought on board to score the new footage. A new score seemed unnecessary for the roughly 5 minute ride, so Imagineers used action music from the films. It features sections of The Empire Strikes Back and A New Hope - the Asteroid Field as you dart around the comets and Here They Come for the Death Star attack run. Bits of the lightsaber duel are also used. Richard Bellis arranged the ride score and re-recorded it with a real orchestra. The thrilling ride was an instant hits with fans when it debuted at Disneyland in 1987. 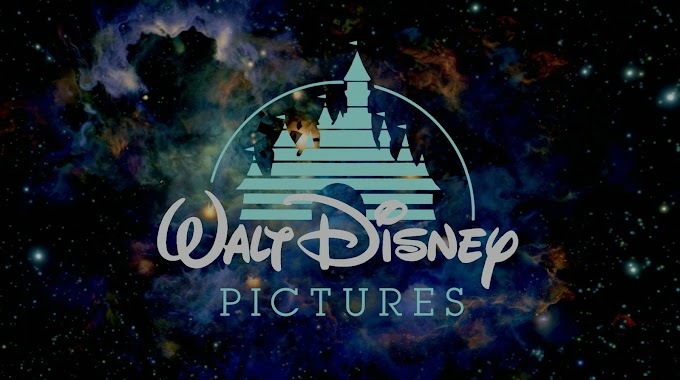 It opened at Disney MGM Studios (now Hollywood Studios) and Tokyo in 1989 and Paris Disneyland in 1992. 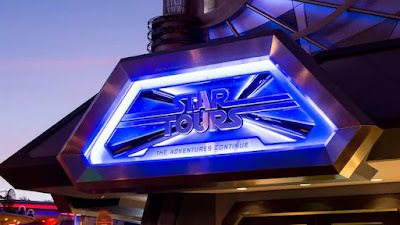 Starting in 2010, each park would begin closing Star Tours for their conversion into Star Tours: The Adventures Continue. For the updated ride, guests are still tourists going to a variety of Star Wars locations. C-3PO and R2-D2 are supposedly performing maintenance on the new StarSpeeder 1000 before the guests arrive and doors close. Of course, that means that our original nervous pilot REX is out of this edition. (He does appear in the ride queue). The ride is about the same length but with an updated ride system, animatronics, and 3D high definition video screens. The biggest change to the ride comes from the randomization and addition of all Star Wars films. While delivering a Rebel spy, there are four videos that can be different on every trip through Star Tours. Each scene option is listed for each scenario. At the end, you land and disembark the craft. The scenes from The Force Awakens and The Last Jedi were added as new choices in 2015 and 2017, respectively. Also added is a landing in the space port of Batuu, the homeworld of Star Wars: Galaxy's Edge. For the music, Michael Giacchino was approached to add new music to the ride. He provided the fun arrangements of John Williams themes for the location travelogues and pre-show videos. The Richard Bellis Star Tours chimes remain through this portion. Asked to write new music, John Williams instead had Imagineers work with his music editor and the original film cues to fit the new footage. For Tokyo Disneyland, William Ross adapted a longer suite for their arrival hall. Big musical cues are all over the listed segments, associated with their scenes and films. Individual characters get their themes, like Vader, Kylo Ren, and Leia. The main planet segments have a range of all the Star Wars films, including TIE Fighter Attack, Imperial Attack, The Forest Battle, Sail Barge Assault, The Asteroid Field, Boys into Battle, and March of the Resistance. Naturally the opening of the End Credits are played as you exit the ride vehicle (straight into the Star Wars themed gift shop). As far as recordings, the original Star Tours music has been on several official Disney park albums featuring Richard Bellis opening music and Williams arrangements. Even the queue source music Droid Rooms made it on an album. Material from Star Tours: The Adventures Continue hasn't been available besides the original film soundtracks. I would love a release of Giacchino's lounge arrangements someday. Perhaps it'll be paired with the music John Williams wrote for Galaxy's Edge.